come back for some celebrating! Last week I was lucky enough to try the new Fiber One Yogurt by Yoplait (it's hitting the shelves later this month) and YUM!! 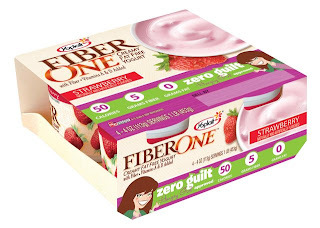 I was already a fan of Fiber One Yogurt, but this time they've teamed up with HungryGirl, cut out 30 calories to give you a yogurt with 50 calories, 5 grams of fiber (that's 20% of what you need per day! ), and zero fat. If you're a Weight Watchers fan, that's ZERO POINTS! I knew I'd love it, but we had to have some taste tests. We tried it out on our toughest critics: Grandpa, my Brother-in-Law, and the kids. Gourmet Grandpa: "It's good. It tastes more like a pudding than yogurt but it's great for a low calorie treat." The Kids: You can see on the video. The DEVOURED it! And I don't want to sound gross, but it helped out my 2-year old who was having some diaper trouble. We're fans!! I'll be sure to post it for everyone!